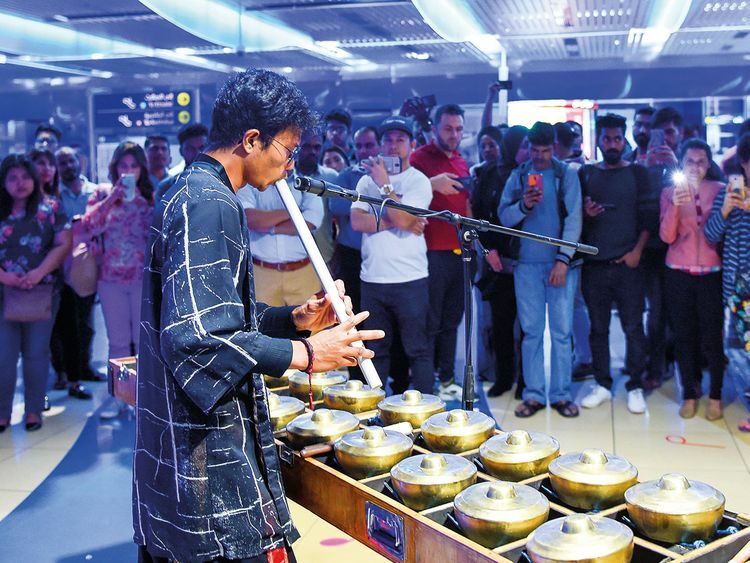 DUBAI: Metro commuters were greeted with delightful strains on innovative instruments on Sunday morning as a wide range of artistes showcased their talents at the Metro stations as part of the first Dubai Metro Music Festival 2019. The Dubai Metro Music Festival is a celebration of global music organised by Brand Dubai, the creative arm of the Government of Dubai Media Office, in partnership with the Roads and Transport Authority (RTA), which will be held till March 23. The first event of its kind to be held in the Arab world, the festival features an eclectic line-up of 25 musicians from across the world. Dubai Metro stations — Burjuman, Union, DMCC, Mall of the Emirates and Burj Khalifa — served as the venue for the festival’s performances, and the artistes moved between them entertaining commuters. The musicians covered both traditional and non-traditional genres of music. Innovative instruments and offbeat musical styles were featured. When Gulf News visited the Burjuman station, Agung Perdana was playing the talempong, a traditional instrument originating from the province of West Sumatra, Indonesia, while Aksana Laukava, based in Dubai for the last two years, played the saxophone. Over the last 15 years, Laukava has performed in various venues across the world. At the Mall of the Emirates station, Omar Hamdan, a professional musician, classical/electric guitarist, Oud player and certified trainer, from Jordon, delighted commuters. With a musical background that includes diverse genres, he has performed with different bands from different styles. He currently performs as a solo artist and also accompanies singers and bands. The artistes perform between 6am and 12 noon and then again from 4pm to 9pm. The Metro Music Festival is a celebration of Dubai’s spirit of cultural diversity and inclusiveness. It was created in line with the vision of His Highness Shaikh Mohammad Bin Rashid Al Maktoum, Vice-President and Prime Minister of the UAE and Ruler of Dubai, as an open platform in Dubai for art, music and culture to flourish. The event seeks to convey Dubai’s messages of harmony and tolerance in the universal language of music.